Okay. So some of you might hate this post, but I’m still going to write it. So if food and nutrition and pictures of therein are not your thing, feel free to skip this one! I try to eat around 1500-1700 calories a day, though myfitnesspal say I should eat more (around 1890 calories a day) and I try to leave enough room with each of my three meals for snacks and treats during the day. I don’t think anyone gains anything by jumping straight into a restrictive diet and saying you’ll never eat this or that again. I don’t think it’s a good thing. Basically, at the moment I’m on something of a salad-esque kick. I think there’s something beautifully simplistic about salads and the fact that you can literally throw a load of different bits and pieces into a bowl and call it lunch. So many people moan about salads being boring rabbit food, but if you think beyond the lettuce-cucumber-tomato box then they’re beautiful, delicious and substantial meals! Salad number one is a base of ‘sweet and crunchy’ salad from Tesco (a mix of iceberg lettuce, red cabbage and carrot), cucumber and tomato with mixed olives, marinated red peppers (I buy big jars of Polish branded ones for fairly little money and lots and lots of flavour! ), a big dollop of red pepper houmous and strips of Hickory Smoked Tofurkey. This was really tasty. Salad number two was a bit of an indulgence and one of my favourites! 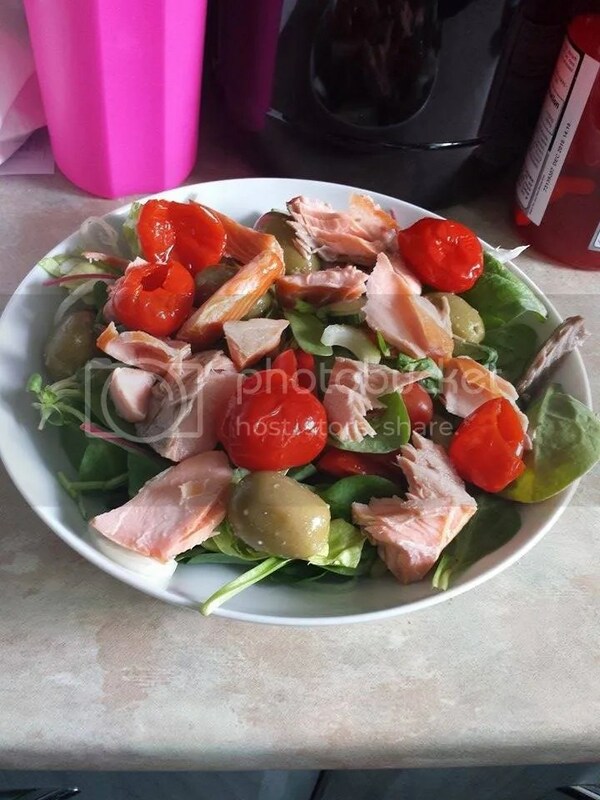 There was a pack of honey roasted salmon in the ‘sin bin’ when I went shopping so into my salad that went, along with mixed leaves (rocket, spinach, that sort of thing), giant garlic-stuffed olives and sweet peppadews. 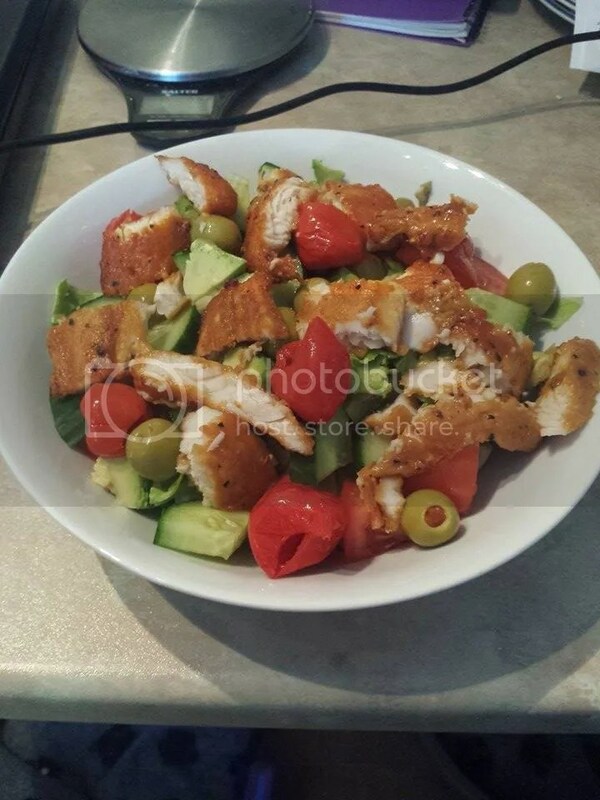 Salad number three is quite possibly the salad that kickstarted my salad obsession! Mixed leaves, cucumbers, tomatoes, pimento-stuffed peppers, sweet peppadews, artichoke hearts, avocado and one of these gorgeous BBQ fish fillets I’ve been buying from Iceland. You cook them from frozen and they’re just so good. Perfect with rice and veggies, chips, baked potato, pasta or in a salad like this. Or any way you’d want to eat some fish to be honest! This one’s less of a salad and more of a bowl. 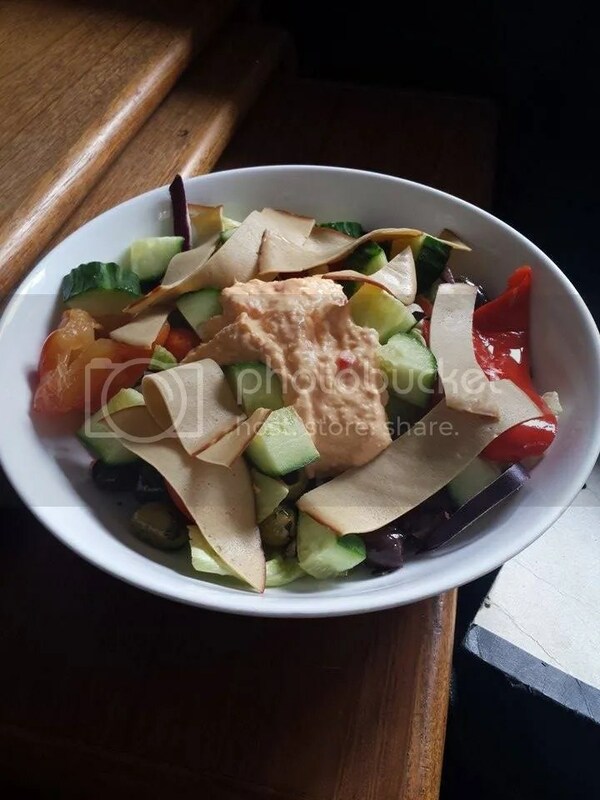 That’s another great way to construct a salad and is especially good if you have lots of leftover veggies from a roast or something; just plonk them all down in different spaces of a bowl and tuck in! 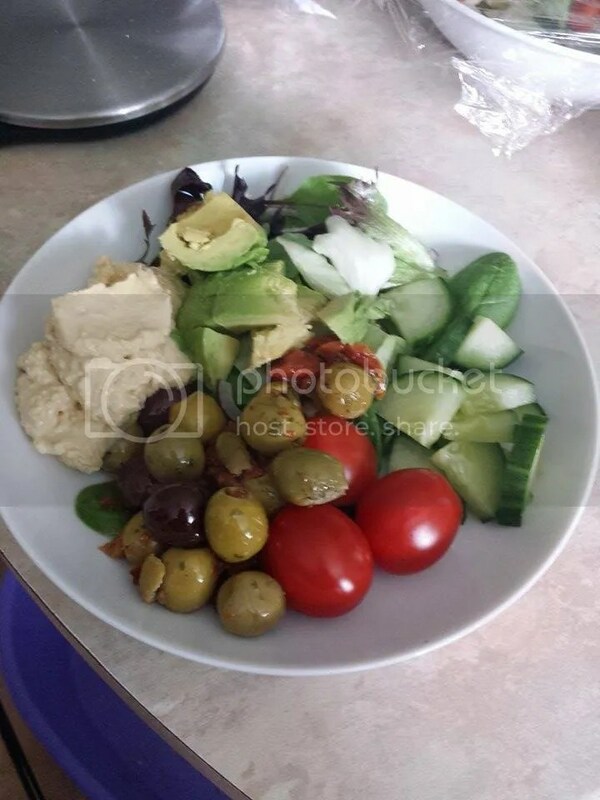 This one was mixed leaves, cucumber, cherry tomatoes, mixed olives with sundried tomatoes, houmous and avocado. This was really yummy. Something else I’ve been really trying to focus on recently is eating breakfast. Now I sometimes still do skip it and that’s normally because either a) I find it really hard to eat early in the morning, so if I’m getting up for a full day of work I can’t eat breakfast because I don’t feel hungry and eating would make me sick, or b) I know I’m eating something huge later that day and would rather save some calories! Probably not a good thing but never mind! I know however that once I’m working proper days as a trainee teacher I’ll need the energy so I’ll have to work out either a way to eat in the morning or take some breakfast food with me to work! 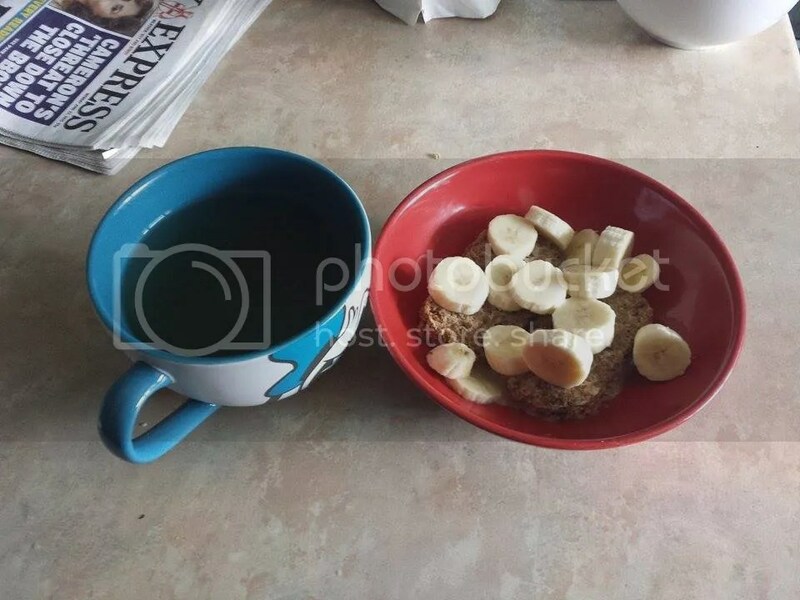 I’ve been loving Weetabix really, with almond milk (lactose intolerant!) and fruit. 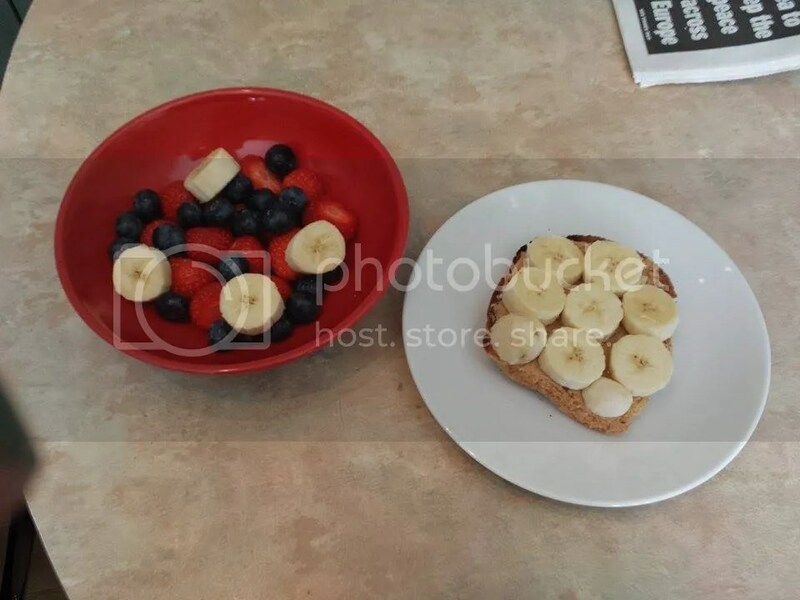 Here I’ve cut up bananas with it but it’s also really good with blueberries or strawberries. I find sweet breakfast easier to eat than savoury, sometimes, though I’m not too sure how good it is for me to start the day with a load of sugar, natural or not! Here I had it with a green tea, which is also something else I’m trying to do- drink more water and tea rather than Diet Coke! It’s working so far! Another breakfast that I enjoy and that is a good energy booster in the morning is a slice of toast, spread with cashew nut butter (I can’t stand peanut butter!) and topped with banana, and I had it here with the rest of the banana and loads of strawberries and blueberries. I think it’s because it’s summer and they’re properly in season but the strawberries I’ve been getting of late have been so tasty. I also do like a savoury breakfast sometimes, even though I said I find a sweet breakfast easier to eat (! ), and my favourite is avocado on toast. Sometimes if I’m eating more of a brunch sort of meal or I’m feeling like stretching my breakfast calories I might have eggs as well. I especially like avocado egg-in-a-basket- toast your bread, spread it with avocado and cut the middle out with a little round pastry cutter. Pop the avocado toast in a frying pan (sprayed with a little cooking spray) and crack an egg into the hole. Flip once when it’s starting to get really opaque, flip out onto a plate, and devour. So good, guys. 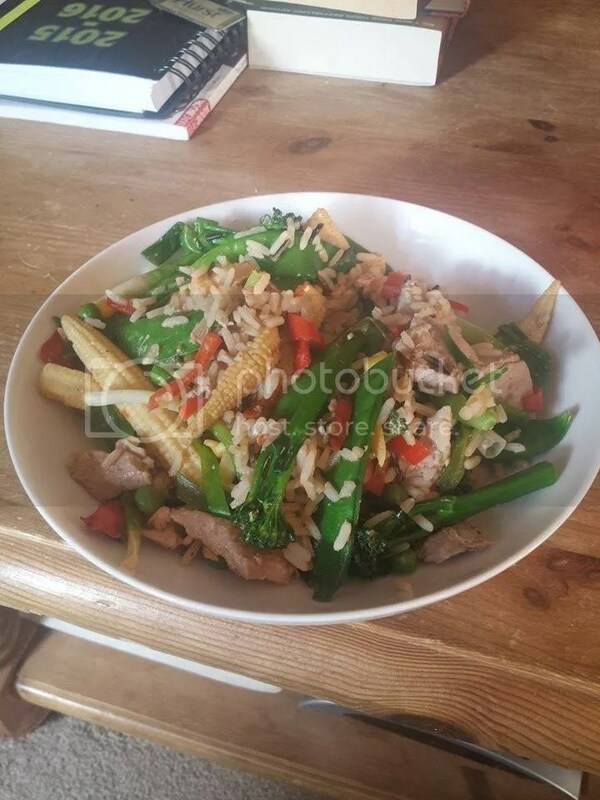 This was dinner from one of the days this week and it was so tasty I’m definitely going to have to do it again! It was just a pack of stir fry veg- mange tout, tenderstem broccoli, sweetcorn and a red chilli I think!- which I cooked up with a little fish sauce and kicap manis, into which I tipped a small pouch of microwave rice and veggies (frozen ones, I get bags of these and egg fried rice and they’re perfectly sized for a dinner portion) and then flaked a mostly-cooked frozen tuna steak. All of the flavours mixed perfectly together, it was lovely and moist and the vegetables were just on that cusp between tender and crunchy. Ugh I can taste it as I write about it and it was so tasty! This was dinner from last night and it was so good I wanted to talk about it! We had a ‘taco and movie night’ yesterday, and the tacos were delicious! My mum goes to Weight Watchers (not for me) and she gets a little booklet magazine thing every now and again. Well her most recent one had this recipe for Quorn tacos and we decided we needed to try it. 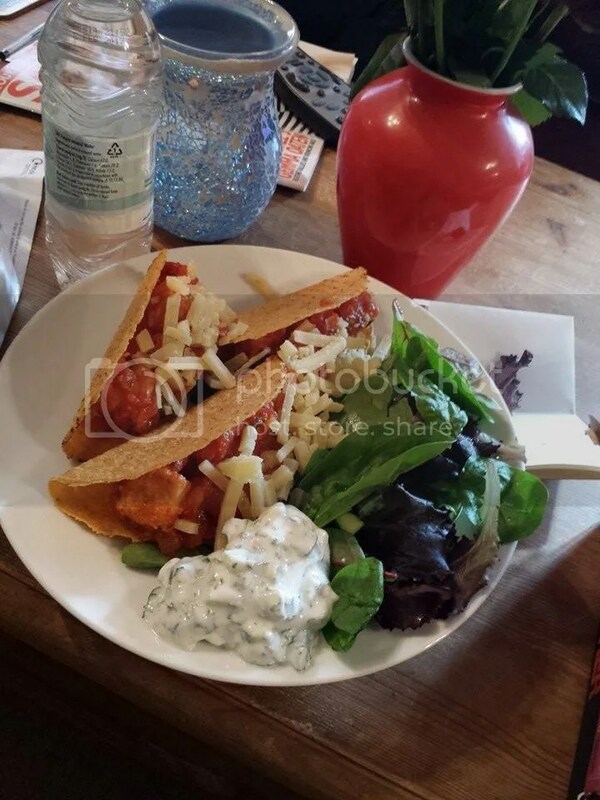 So here are delicious Quorn tacos, served with reduced-fat cheese (mum insisted), homemade tzatziki (fat free yoghurt, fresh mint and cucumber) and a green salad. We also had a few prawns that needed using up as well, and I may have stuffed some of them into a leftover taco shell (as may have my mum…) but this felt like an indulgent treat whilst not being too bad! 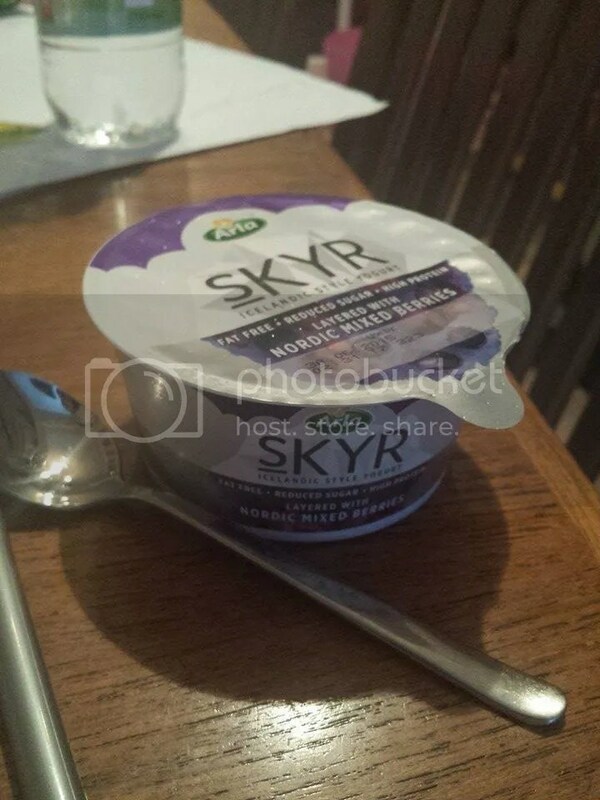 Finally- this isn’t a tasty meal I’ve put together myself, but I just have to declare my love for Skyr yoghurt. This stuff is so good, I actually prefer it to my previous favourite of Fage Total 0%/Fruyo. It’s Icelandic yoghurt, it’s super high in protein and fat free, and I like ALL OF THE FLAVOURS. Natural/plain, layered with Nordic Mixed Berries/Strawberry/Apple and Lingonberry/Sour Cherry… it’s all good! I haven’t tried the honey one but I assume that’s just as delicious. YUM. PHEW. So that’s some food I’ve been eating recently. If you’d like me to, I’d be more than happy to share any recipes. Is this something you’d like me to post more of in future? What have you been eating recently? Let me know! 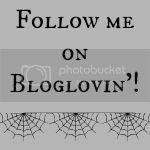 This entry was posted in Fashionista Musings, Food/Recipes/Nutrition, Lifestyle, Weight/fitness and tagged food, Lifestyle, Nutrition. Bookmark the permalink. I loved the toast-egg-avocado idea! One of my favorite things to eat is avocado and Vegemite (blame the aussie-ness) in the mornings, and those salads looked spectacular too! Toast/egg/avocado is amazing. If Marmite tastes anything like Vegemite (I’ve heard differing opinions!) then I might just give that a try!